P ort Bouvard Charters is a family owner/operator run business. A family of fishermen and women that is! Together between us we have many many years experience on the waters of Western Australia. We are also focused on providing high-quality service and customer satisfaction and we will do everything we can to exceed your expectations and strive to deliver you the fishing experience of a lifetime. Fishing is our passion, we live and breathe it — even on our days off we are still out on the water fishing! 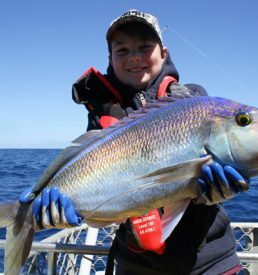 We offer fishing trips all year round in the best locations Western Australia has to offer. 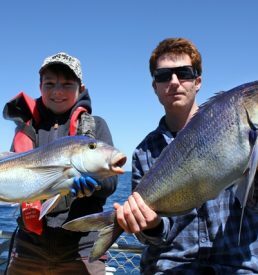 We offer sport and reef fishing out of Mandurah. If you’re traveling to Perth and looking for a fishing charter during your visit, Mandurah is a great option for you and less than an hour south of Perth and offers access to miles of ocean coastline and inland waterways. 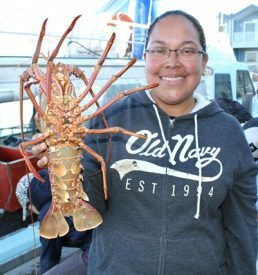 Remote fishing adventures, check out Blue Lightning Charters? And remote live aboard trips out of the Montebello Islands from June to December. Port Bouvard Charters has recently found new owners with the same passion for fishing upon Helsinki II a 48ft Conquest charter vessel. Captain Martin Paull has fishing in his veins and over 30 years experience of fishing. Booking Master Sarah Paull – together will make sure your day trip is enjoyable. Crew – Jason is also experienced fisherman on board.